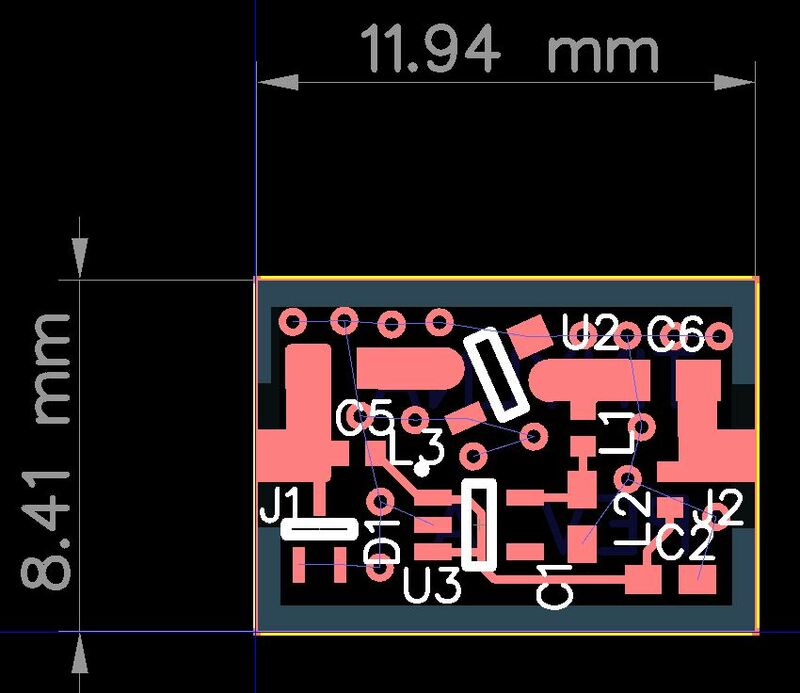 Now that I've completed the schematic, I've transferred over to the PCB layout tool. It's a tight fit, but there should be no problems. 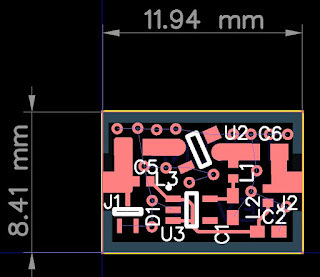 It's not the best RF design, but I think the small size will forgive many of the problems. I've used 50 ohm impedance traces as best as I could. My only concern is the amount of DC power going through the inductors. Those are some small inductors so I'm worried the MMIC will draw too much power. The datasheet says 80mA max, but I will build the board and measure it. The inductors saturate at 100mA, so I should be ok. The image below is without the top and bottom copper pours turned on. This is certainly going to test my soldering skills. Since the board is so small, I've decided to use OSH Park for the fabrication. They charge by board size, which is perfect for this board. They've quoted me 80 cents for three boards (that's $0.80). How can you beat that? I'll just have to wait a couple of weeks for them to get here. I chose to have exposed metal around the edges so I have lots of soldering options for my ground. 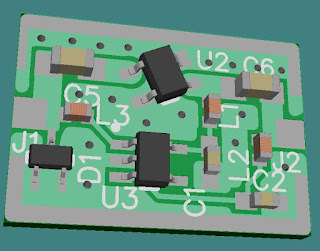 Normally I would space the ground away from the board edge, but I think that may be my only option for soldering ground.